This recipe is for traditional, classic Korean dumplings, which everyone loves! Add 1 ts of salt, 1 tbs of sesame oil, ½ ts of ground pepper and mix it by hand and push the mixture of meat on the side of the bowl. Wash some Asian chives (buchu), and dry well with a paper towel or cotton cloth. Chop them into 2 cups’ worth of chives. Add 1 tbs of oil and mix it up. Place it in the big bowl next to the ground meat. Chop 4-5 soaked shiitake mushrooms and half an onion. Put them into a small bowl. Add 1 ts of soy sauce, 1 ts of sugar, and 2 ts of sesame oil to the small bowl. Mix by hand and transfer it to the big bowl. Squeeze a half package of tofu with a cotton cloth or paper towel and put it into a small bowl. Add a pinch of salt and 1 ts of sesame oil. Mix it by hand and then put it next to chopped chives. In the big bowl, add 3 cloves of minced garlic and mix all ingredients by hand. This is your mandu filling. Put some of the filling mixture into the center of a mandu skin. Place some vegetable oil on heated pan and add the mandu you made. Lower the heat to low-medium and put the lid on the pan to cook. Turn over each mandu a few minutes later. Add 2-3 tbs of water and put the lid back on the pan. Cook a few minutes more over low heat. When the mandu is golden brown, transfer it to a plate. Serve hot with a dipping sauce made of equal parts vinegar and soy sauce. In a pot, place 6 cups of water, 8 dried anchovies, the leftover shiitake mushroom stems, and the leftover onion. Boil it over medium heat for 20-30 minutes. If too much water evaporates, add more. When the stock is done, remove the anchovies and onion. Add 1 ts of fish sauce, 2 cloves of minced garlic, and some of your mandu. Keep the lid on the pot. You can add some more salt if you want. When the mandu has cooked, it will float to the top. Add 1 beaten egg, 2 sliced green onions: Done! Serve hot with a bowl of kimchi, and ground pepper to taste. Posted on Saturday, May 3rd, 2008 at 12:46 pm. Last updated on February 17, 2018. Posted December 10th, 2018 at 1:55 am | Log in to reply. FLAVOR: ADD FLOUR. ADD 2 TABLESPOON OF FLOUR (ALL PURPOSE WHEAT FLOUR) FOR EVERY 1 LB OF MEAT. MUST INCREASE THE QUANTITY OF SALT AND SPICES. CONVENIENCE: SSAM STYLE. COOK THE MANDU FILLING AND MANDU WRAPPERS SEPARATELY THEN EAT TOGETHER. CONVENIENCE. KOREAN MEATLOAF, AND IT IS MICROWAVEABLE. MANDU FILLING AND BULGOGI MEATLOAF. Posted November 28th, 2018 at 10:10 am | Log in to reply. Maangchi, after freezing the mandu, how do you pan-fry it while ensuring that the pork is cooked through all the way? I keep seeing pink inside my mandu and I am unsure on how to properly pan-fry from frozen. Any advice would help! When I boil it in soup, it comes out perfect. Posted December 2nd, 2018 at 9:25 am | Log in to reply. 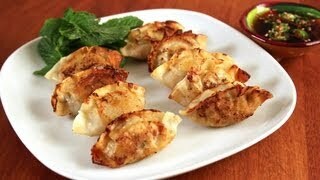 I cook the frozen mandu on the pan with some vegetable oil until both sides turn a little brown and crunchy. Then I add a few spoons of water and turn down the heat to low, and cover and cook until the pork is fully cooked and the skins are crunchy. Posted November 16th, 2018 at 8:24 am | Log in to reply. Hi Maangchi, what soy sauce type and brand are you using for the dipping sauce? Posted August 16th, 2018 at 1:36 pm | Log in to reply. Hi Maangchi, do I use the whole anchovy inside the tea strainer or do I need to remove the head and guts? Posted August 22nd, 2018 at 8:40 am | Log in to reply. Always remove the head and guts! And you can put it in the tea strainer, or boil and take them out with chopsticks. Posted August 22nd, 2018 at 9:05 am | Log in to reply. Thank you Maangchi! I made the dumplings with my daughters and they were delicious. Posted June 20th, 2018 at 1:14 am | Log in to reply. Again, thanks for all your lovely recipes Maangchi!!! Posted June 16th, 2018 at 3:24 pm | Log in to reply. Hi, Maangchi, I just made the filling, but our dinner plans got moved back one day. Just curious… Do you still recommend freezing the mandu, or can I fill each mandu and keep them in the refrigerator for one day then cook them? I probably won’t have time to fill each ine tomorrow, but will they dry out in the refrigerator? Posted May 29th, 2018 at 10:03 am | Log in to reply. My cat, learning how to make Mandu. Posted May 28th, 2018 at 1:26 pm | Log in to reply. Made Mandu last week. Didn´t have Tofu available at my home town, so had to skip it. Also skipped pork. Buchu I had purchased at my last visit to Quito, at Seoul Market. Decided to stir fry the filling (as I had seen in another Mandu recipe), to be able to preserve it longer. Also had to cope with square Mandu-pi, as no round one was available. Next time I´ll make my own. Didn´t make the broth, but used the chicken broth I´d made for Dak-kalguksu instead. The result was super tasty. Also fried some Mandu: was so tasty that I didn´t even bother to make the dipping. Posted June 12th, 2018 at 1:44 pm | Log in to reply. BTW: I used egg white to stick the Mandu-Pi together, in stead of water: sticks much better. A trick I had learned from my chinese college friend Xiao Quing when making Spring Rolls. Posted April 18th, 2018 at 4:14 pm | Log in to reply. Thanks for this recipe Maangchi-ssi! It’s super easy to follow, I am pretty proud of my mandu. I steamed them and ate them with rice and kimchi. Posted February 14th, 2018 at 11:28 am | Log in to reply. Posted February 17th, 2018 at 2:22 pm | Log in to reply. Posted January 28th, 2017 at 3:21 pm | Log in to reply. How many mandu does this recipe make? Posted February 17th, 2018 at 2:25 pm | Log in to reply. I had to check this video to see how many I made! It makes between 50 and 60. 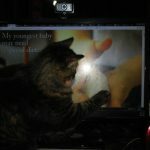 This recipe was originally posted on May 3, 2008 at 12:46 pm by Maangchi. It was last updated on February 17, 2018. The video was watched 742,910 times on YouTube & has 4,728 likes!